Request Quotes! Get up to 4 Free, Non-binding New Product Quotes from Local Installers in the UK. 1 Where do you need the water dispenser? Please specify where you will need your water dispenser. 2 Would you like a hot or a cold water dispenser? Please specify what water temperature you need. 3 What type of water dispenser would you like? Please specify what type of water dispenser you would like. 4 How many users is the water dispenser for? Please specify how many users your water dispenser will have. 5 What is your preferred time of purchase or installation? Please specify your preferred time of purchase or installation. 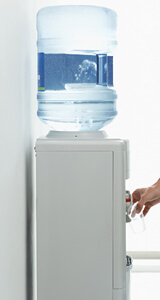 A water dispenser is a device that can provide cold, room temperature, or hot water, and is a common feature of offices, businesses, as well as public areas. This type of product can typically be divided into two types: a point-of use (POU) water dispenser and a bottled water dispenser. These two types can typically either be a hot water dispenser, a water cooler, or they can have both capabilities. The point-of use (POU) water dispenser is directly plumbed into the mains of water supply, and distributes cold, room temperature, or warm water. The bottled water dispenser requires the purchasing or rental of large water bottles from suppliers. These bottled water dispensers can have a water capacity that varies from 4 to 40 litres of water. As it is for coffee machines, office water dispensers can have positive socialising effects on the workplace, and at the same time improve the productivity of a company. Choosing the perfect dispenser can be chaotic, as every business has different needs and requirements. There are a range of water dispenser types, and in order to determine what would be best for your business, a good starting point is to determine the capacity your office would need. If you wish to have professional assistance in selecting the right water dispenser, simply fill in the form above, and Market Inspector will help you find the perfect solution for your business! We provide you with up to four quotes and match your request to our best suppliers, completely non-binding and free of charge! Generally speaking, there are two types of water dispensers: plumbed in (or Point of Use), and bottled water dispensers. Within these two categories, there are dispensers with distinctive characteristics that distinguish one dispenser from another: from a freestanding water dispenser, a tabletop one, or a plumbed in one. By installing a water dispenser in your office, you gain access to clean water directly in your bottle, cup, or glass, simply by the press of a button. Providing your employees or customers with fresh water can reduce the use of plastic bottles in your office, and ultimately make your company a bit more sustainable. Water dispensers are more than just simple products to provide clean, cold, or hot water. They are a point of encounter for employees where they can take a break and talk about something different from work. This gathering ability has its own name: ‘the water cooler effect’. Despite sounding counterintuitive, mini-breaks can improve the productivity of your employees. It is important to find out your business needs in order to select the water dispenser that best suits your company. These two different designs are both categorised under bottled water dispensers. What sets them apart is where the bottle is located. The most classic type of dispenser is the top mounted water dispenser, where the water supply vessel is mounted on the upper part of the water dispenser. Instead, the vessel for the bottom loaded type is positioned in the lower part. Bottom loaded water dispensers are easier to reload compared to the top mounted. Yet, the top mounted dispenser is generally less expensive. These types of water dispensers are between the best solutions for small businesses. It is possible to find bottom loaded and top mounted dispensers that provide cold, room temperature, and warm water. This is a type of POU water dispenser that is connected directly to the water supply and electricity. This water dispenser is mostly used in schools, hospitals, and big businesses. The connection to the water mains allows this dispenser to never run out of water, and to dispose of the greywater. Instead, the linkage to the electricity helps the refrigerator unit to run. As a result, this type of solution only provides cold water in a stream. This type of water dispenser is also part of the point-of-use water dispensers category. Different from the wall mounted type, this water dispenser is not built in the wall and can provide the user with both hot and cold water. This group of water dispensers are part of both the main categories of water dispensers, as they can be either plumbed in the mains of water supply, or come with bottles of smaller dimensions. These devices are smaller in comparison with the other types of dispensers, which makes it possible to place them on tables and counters. This group of dispensers, thanks to the dimensions, are the perfect fit for small offices and businesses. This type of dispenser can be found in both categories of water dispensers--point-of-use and bottled. In these devices you can find two different systems: the cooling system that allows you to have chilled water thanks to a vapor compression refrigeration or thermoelectric cooling, and the heating system, which is generally combined with a hot tank that can provide both the hot and cold water. This type of water dispenser only supplies warm or temperate water. This product can be installed under an existing sink, or bought as a stand-alone device. As a stand-alone product it can have different features: it can be either point-of-use or bottled water dispenser. In the latter case, it can have a water tank that ranges from 1 to 30 litres. Calculating water dispenser prices can be challenging, as different types and characteristics can overlap. For each dispenser there are different prices according to the features included. Prices can also have a wide range, from £99 for a simple bottled water dispenser, all the way up to £2,500 for a plumbed in water dispenser that provides hot, cold, ambient, and sparkling water. During the process of purchasing a product, the most important and time-consuming step is the collection of useful information. Nevertheless, the final decision is heavily influenced by the amount of users that will be using the water dispenser, and its price. For example, the plumbed in, or “point-of-use”, water dispenser has a starting price of £100 and a maximum of £2,500. Instead, bottled water dispensers have a price range from £100 to £570. While for a product such as countertop bottled water dispenser, the price can start from a minimum of £180 to a maximum of £880. Every water dispenser has its own requirements that usually depend on the specific product design. Even so, it is possible to identify some general preconditions for each type of dispenser. 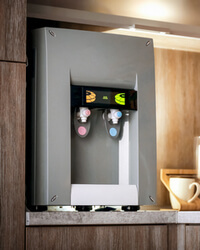 For example, the bottled water dispenser by definition does not require the connection to the water mains, but rather needs the bottles of water. On the contrary, the point-of-use models need a connection to the plumbing system, but do not require the bottles of water. Also, products such as top mounted water dispensers, that only dispense temperate water, do not require a connection to electricity. Instead, devices with more features need a continuous power source. In the following table, you will find all the fundamental requirements for each type of water dispenser. Still, in some variety of dispensers, the design of the model changes the preconditions of the room in which you want to place the device. Your choice of water dispense type will determine the installation and maintenance process. Different water dispenser models have different designs and features: while some models will require a technician to come on a regular basis for maintenance work, others will require you to have an ongoing relationship with your supplier for the supply of the water bottles. Finding the right water dispenser can take a lot of time. That is why we present the leading water dispenser suppliers in the UK, to help guide you to the one that fits your business best. Each of them is able to offer various solutions depending on your needs. Today there is a wide variety of water dispensers, and choosing the perfect fit for your business might be tricky. There are multiple options and suppliers available on the market with specialised services. Market Inspector can help find the best water dispenser for your business and for your employees and customers. Whichever model you choose, you can rest assured that a water dispenser is not a small addition to your office–it can be a gathering point for employees to meet, discuss, and socialise to get a small break from their tasks and return to their tasks re-energised and more productive. If you would like to receive professional advice and reviews from experts simply fill in the contact form above. You will receive up to four free quotes that are non-binding and tailored to your company’s needs.